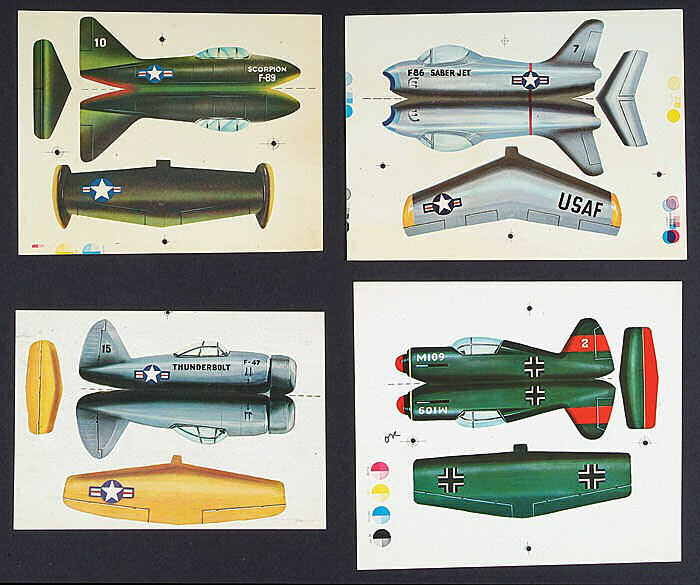 I've got a bit more to say on Topps Fighter Planes, last looked at here in 2011. 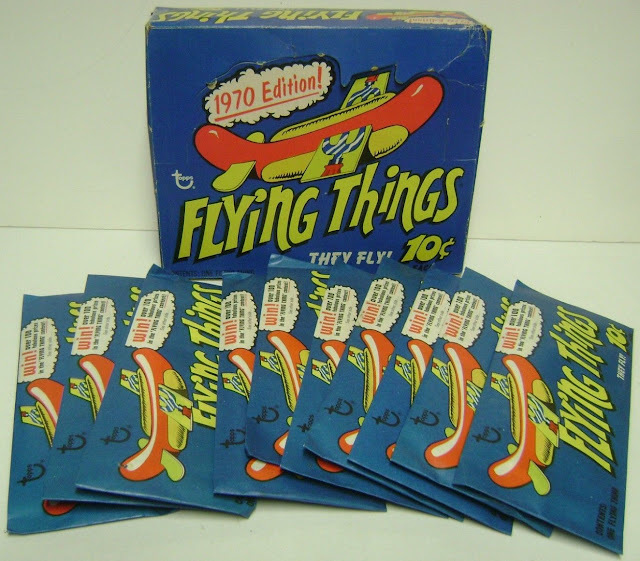 Looking at them in the context of a Topps mania for flying aircraft novelties, that ran from the mid 60's until the mid 70's, they seem to fit into the gaps of Flying Things, which were issued in three waves (circa 1966-67, 1970-71 and 1975) and Marvel Flyers (1966). I've shown those previously and they are courtesy of Howard Schenker. The set of 24 seems to consist mainly of a mix of World War 2 and Korean War fighter jets and newer planes introduced in the 1960's. If you look at the checklist carefully you will see the first plane listed is the F-111. This would be the "Aardvark", manufactured by General Dynamics and introduced in 1967. Given the F-111's debut date, the set could not have been issued any earlier than 1967, which is my best guess as to a date right now. 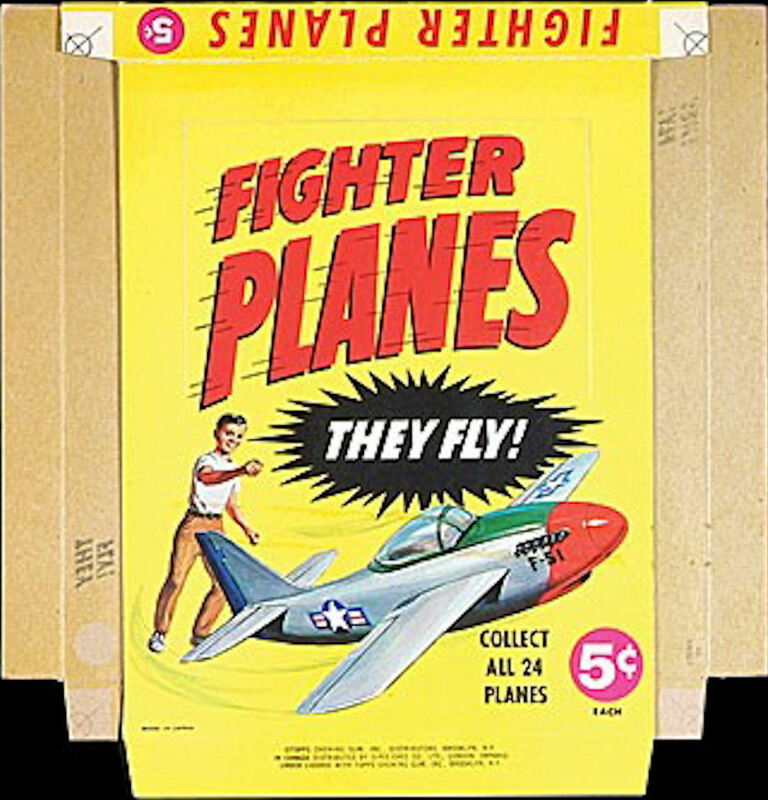 I suspect the Fighter Planes were issued after Marvel Flyers (which had a ten cent price point at a time when Topps was firmly entrenched with five cent packaging, maybe due to the costs of licensing) but before Flying Things (ten cents on all packaging for the first four series). 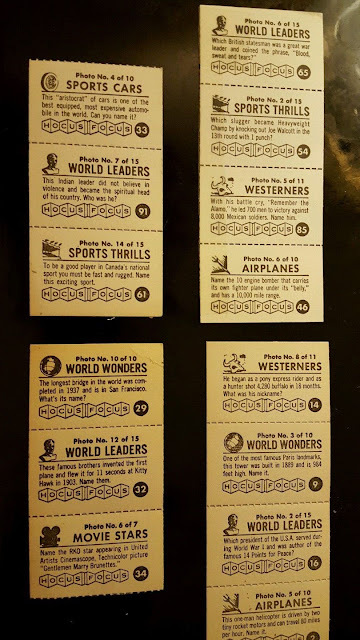 In any event, Topps mostly dropped five cent pricing in 1969 (Stickers and Tattoos being the most common exceptions) so there is really a three year window in which they could have been distributed. 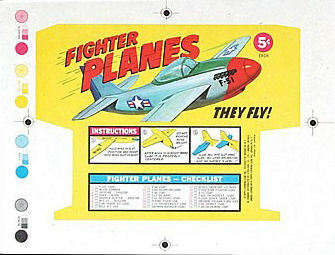 Other companies offered similar styrofoam planes and indeed they were popular boys birthday party favors back in the day. Topps reissued certain Flying Things series in similarly cut down fashion as time progressed, going from a high of 24 planes to a low of 6 by 1975. I'm not sure what year the ten cent version was issued though, maybe between the 1970-71 and 1975 Flying Things would be my guess but a product code would seal it. It's a neat set and a bit hard to find compared to Flying Things and Marvel Flyers. If you are a fan of confusion, this post is for you! 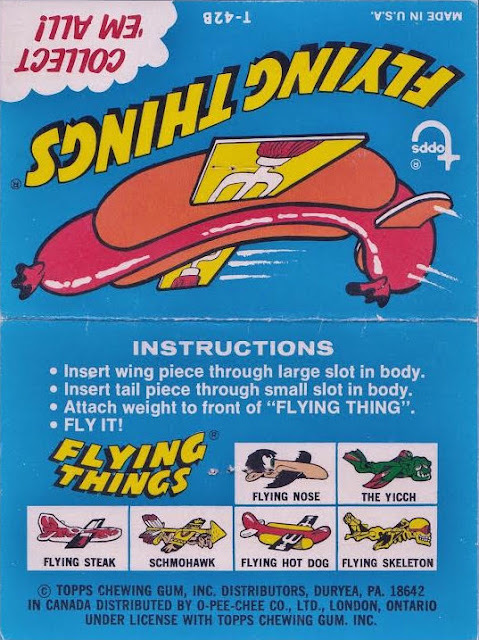 Over a roughly ten year period from 1966-75, Topps distributed a series of user-assembled styrofoam gliders called Flying Things. I touched on them briefly back in 2013 but I've been researching them lately, along with the related Fighter Planes and Marvel Flyers sets. 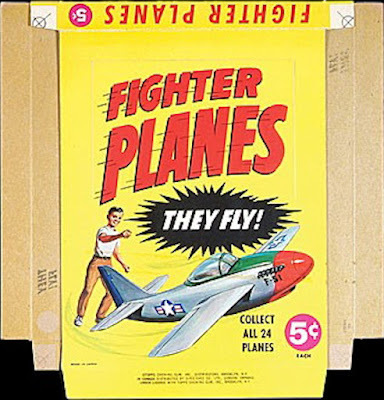 Flying Things saw multiple releases over this span, while Fighter Planes was issued twice and Marvel Flyers once. I'll leave the latter two for a later post and will probably have a Flying Things followup as well as this post will be all about the wrappers. I'll try to put things in chronological order but as we'll see, it's difficult to do so with precision. The Flying Skeleton would have been instantly appealing to a little boy in the mid 60's. I was one of those boys but for the life of me cannot recall ever seeing a Flying Thing anywhere. I have zero memory of these as a kid. The Things were made in Japan and Topps is listed as distributor, which is something not often encountered. This may mean they licensed Flying Things from a third party, something I am working on determining. Given the curved Topps logo and Brooklyn address this can be pinned to an early 1966 to mid 1969 time frame, although as we will see below there is now an anomaly to this theorem. No change to the indicia, although .the assembly instructions have gone to a more graphical look. I suspect the first series came out in 1966 and the second in 1967 but there are no production codes to go by. It's a little hard to make out but there is a product code that reads: 453-55-1, which puts us in 1971. And, if you are really eagle-eyed, you will note the address is back to Brooklyn, two years after they had made the changeover to Duryea. I'm not sure why this is; it may have to do with which corporate entity was importing these from Japan. But wait, there's more! That;s the same graphic but the Topps logo got moved to the right and a line about the contents was added (CONTENTS: ONE FLYING THING). Maybe someone thought there was more than one Flying Thing in each pack and complained? Again, it's tiny but the product code has changed to 453-06-1 from 453-55-1 on the orange wrapper. The test pack was a vertically-aligned cello bag and I believe it was intended to be displayed using a J-hook. It has a test code as shown below. I suspect that there is also T-42A out there as well. As you can see, they only started with 6 titles before moving to 12 when the first series was put into production. In addition, the nose clip on the test bag "Thing" was made of METAL and not plastic like all the other series. I grew up in Toronto and did buy some of these around 1970-71 but they were not manufactured by O-Pee-Chee. I believe the ones distributed in Canada simply reused the Topps packaging. The timing of the test is odd, since the series had obviously sold well previously but a metal nose clip in the early 70's is about five years after they went with plastic for the retail releases. It's a bit of a mystery. And as we see above, there is indeed a T42A out there. Still, the graphics match up with the 1970 Flying Hot Dog Wrapper above so it likely was a test before they released Flying Things again. Most of the names have been truncated from the earlier releases but at least we are back in Duryea (and made in the U.S.A.) but still Topps is the distributor. Curiouser and curiouser. With the primary focus here shifting to the 60's and 70's, I thought it would be a good time to run through some of the key phrases and nomenclature I use to identify certain traits of historical Topps production. A number of these identifiers were covered in a post a while back that got into things such as eras of card production and the difference between a proof and test issue, so this one will mostly cover things not addressed previously. Giant Size: This refers to the regular issue cards measuring 2 5/8" x 3 3/4" issued between 1952 and 1956. The name comes from Topps own advertising and box art. 1954 Baseball is an example. Standard Size: Cards measuring 2 1/2" x 3 1/2". An example would be 1971 Baseball. 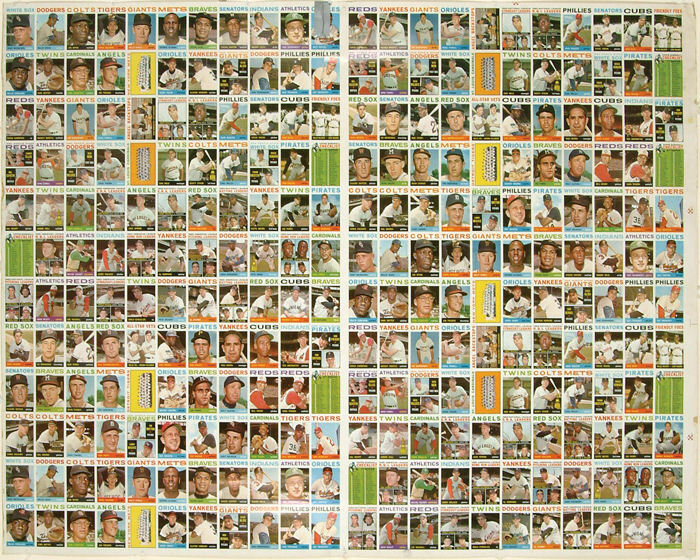 Uncut Sheet: What most people refer to as an uncut sheet is generally a Half Sheet. Using Topps Baseball as an example, these are arrayed 10 cards by 10 cards (10 x 10) from 1952-54. 10 x 11 from 1955-56 and then after the card dimensions were reduced from Giant Size to Standard Size, 12 x 11 from 1957 onward. So a half sheet from say 1964 would consist of 132 cards. Two half sheets of 132 make up a Full Sheet of 264, with each half sheet divided by a gutter in the middle. Rule of 11: This is a phrase I coined to describe how most patterns in standard sized Topps sets are divisible by 11. This is due to the row length on the half sheets being 11 cards in length. Short Print (SP) - Can also stand for Single Print. A cards printed in lesser quantities than the majority of cards on a sheet. Usually this means by a factor of half but not always. Many cards identified as SP over the years in price guides were designated so on the basis of observation of half sheets and may not be short printed at all. While a card can be an SP on a half sheet, in order to determine if a card is truly short printed within a series or set, the full sheets must be seen. Double Print (DP) - A card appearing twice as often as other cards. A 110 card series printed on a half sheet of 132 would have 22 DP normally. Triple Print (TP) - A card appearing thrice as often as other cards. A 55 card series printed on a half sheet of 132 would have 22 TP. Quadruple Print (QP) - A card appearing four times as often as other cards. Unusual but not unknown. a couple of 1955 Baseball cards may fall into this category. Over Print (OP) - This can mean a variety of things. It's sometimes used to identify cards printed in a ratio of 3:2 but it can really refer to any card printed in more quantity than an SP. It can also refer to part of the printing process where one image is inadvertently printed on top of another. Theory of Checklist Relativity: Another phrase of mine. This refers to Topps seeding a checklist from the next series in all but the high number packs from 1961, the year individual, numbered checklists began, through 1972, the last year of cards issued in series. For example, they would print the second series checklist on the same sheet as the first series cards and do so throughout each press run/series. This was a cheap way to preview what was coming in the next series. It also led to myriad checklist variations over the years. 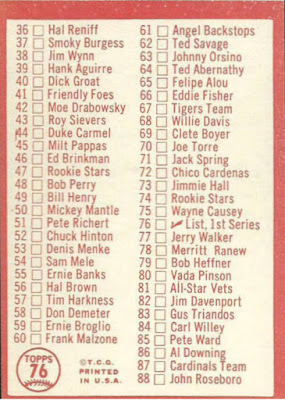 Series Lagging: Topps would, in addition to seeding checklists, lag their series counts in many sets from 1958-66, especially Baseball. Take a 110 card press run (leaving 22 DP on the half sheet). Now make the first series 88 cards and show it that way on the corresponding checklist. That leaves 22 cards above #88 that are shown on the second series checklist which were printed in the first press run, although the inclusion of the next series checklist reduced that count by one with with each successive series (so Series 1 ends with #109). The last series would see the numbering and series matched up again. This was another way to entice kids to buy the next series. 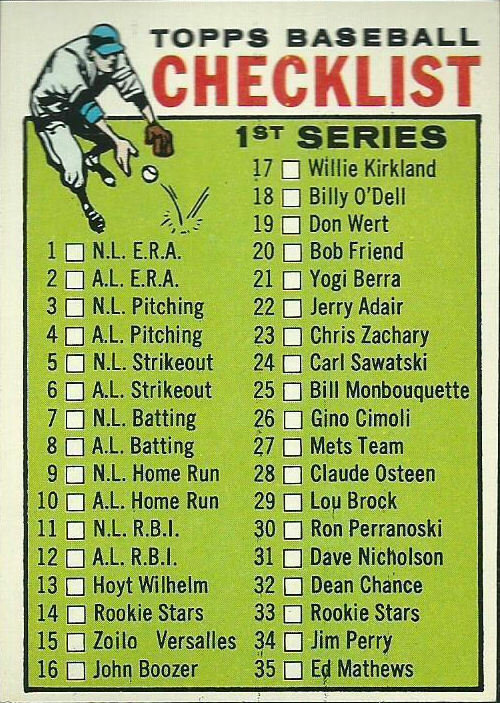 Once the set sizes started growing in 1967, the series checklists added more cards and the practice stopped. Note too that from 1958-60 checklists were printed on the backs of team cards while the 1957 checklists were inserted into the packs and were not printed with the rest of the cards. Now take a look at this uncut full sheet from 1964. Rows A, B, C & D are over printed and appear three times over the full sheet, while rows E, F, G H, I & J are short printed and only show twice. This is a 3:2 ratio. So we also have overprints. 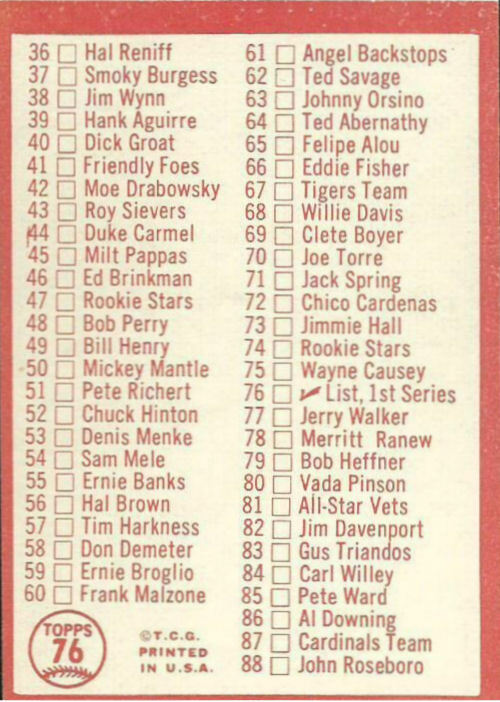 The sheet runs from 1-109, if you number the columns, #109 (Rusty Staub) is at position D7. I think the 1st series checklist is at the right edge of row D and the left edge of F while the 2nd series checklist is on the right edge of row I but they are hard to make out. Series lagging and Theory of Checklist Relativity are present and accounted for though. 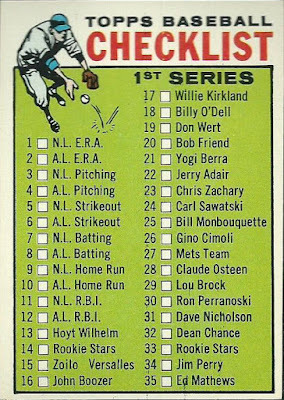 The patterns such as checklist placements, overprint ratios and even the arrangement of each 11 card row do not necessarily repeat like this for all series or years. Why Topps did things a certain way I can't really say but this first series sheet from 1964 really illustrates a lot of their marketing strategies. We'll shortly be moving more into the 1960's and early 70's in terms of the overall vibe of this blog but there are still many things from and about Topps in the 1940's and 50's worth posting about. Near and dear to my heart are the postage stamps sized issues of 1948-49 and the last gasp of those little wonders, the Hocus Focus set of 1955. Still without a complete checklist for the smaller sized version some 60+ years after issue, the whole set is a bit of mystery in terms of timing and packaging, although I suspect it was retailed in response to another confectioner's offerings. I like how you can make out the bare outlines of the World Leaders subset in panel 3. It's a lot more detailed than most instructional drawings from Topps over the years. The card also shows signs of high speed "ribbon cutting' where strips of uncut cards were cut at high speed, resulting in a slight curl that's just off kilter. 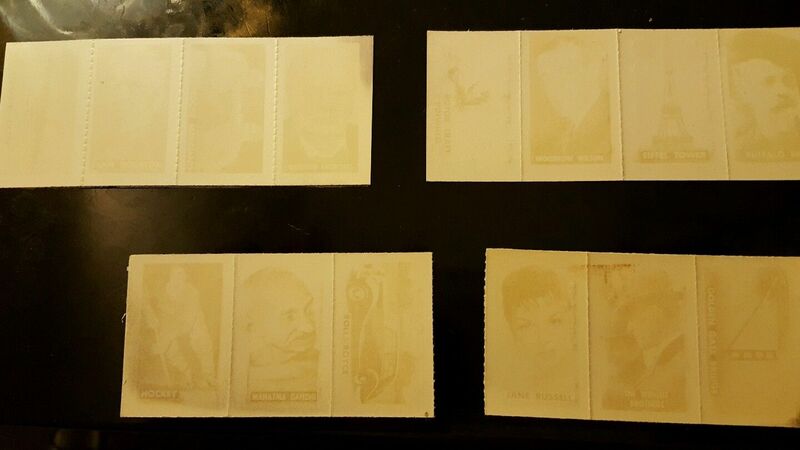 I post reverses of things even when blank to help identify potential counterfeits. I still need an example of the blue developing paper and although I don't collect wrappers per se, I do collect the penny wrappers from these tiny little issues. It's one of those sets where the backs look nicer than the fronts! As previously noted on the blog, the small cards do not show signs of perforations or dotted lines as they were inserted as singles in the penny gum tab packs. As I stated above, I'll be focusing more on the 60's and 70's going forward but will still, of course, post anything worthwhile from the earlier decades of Topps as items come to my attention.